“Hey! Do you think I could sell it?”… Well I sure did. 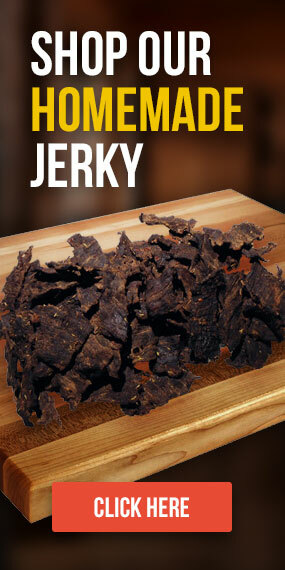 We began with a very simple goal, that was to make better beef jerky than anyone else in my Boyscotut troop. Well, after many trials me and my Pop came up with a flavor that was undeniably delicious. We called it ‘Mild But Wild, and that was our flagship product that started this wildfire. We use only fresh angus beef, the eye round cut, hand trimmed and sliced right. Our marinade is a blend of sauces, spices, juices, natural sugars, and secret ingredients, designed to render each unique flavor. We use “all natural” preservation methods, which are a time test healthy alternative to the chemical preservatives our competitors use. We thank you kindly for your patronage and if y’all have an idea for a new jerky, send it on over and we just might make it for ya. Have a good one and God bless!